This recent UK heatwave is not only melting my chocolate but it’s forcing me to look at alternative ways to get my chocafix. Don’t get me wrong, even on the hottest days, when my choc du jour has melted beyond anything vaguely resembling a bar, I still can never be persuaded from my chocaholic ways. I took a left turn in the supermarket from the chocolate aisle and entered the frozen food section. Quickly bypassing the the oven chips and chicken nuggets my eyes soon fell upon the shiny cabinet of all things chocolate-ice cream. Bliss. I chose a box of four Galaxy – Vanilla Heaven. Maybe it was the fact it was Galaxy that prompted this choice ( I do like Galaxy it has to be said. Have we reviewed Galaxy yet? No? Ohh…must buy Galaxy tomorrow) Maybe it was the name, Vanilla Heaven? My mind does tend to go off at tangents and as my favourite photo site is Fotonomy – photography Heaven …. well, you can see where my mind was at can’t you? Or maybe it was the wrapper? It has to be said the wrapper is rather pleasing on eye, for such an affordable ice-cream bar. Described as Creamy Vanilla Dairy Ice-Cream with a smooth GALAXY chocolate heart this ice cream appears to be two fingers of choc-ice cream, although trust me, there is no need or reason to separate them. It is just the right size to be able to take a bite without disgracing yourself in public. 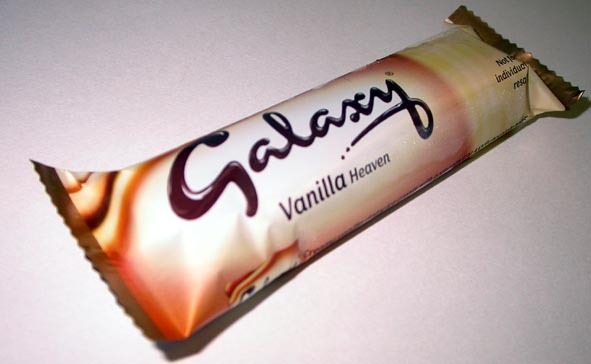 When it comes to turning your traditional chocolate bar into an ice-cream version, I reckon Galaxy already have an advantage. Galaxy is softer, meltier than other chocolate, which is perfect for accompanying ice cream. The vanilla ice cream is indeed as the wrapper states, creamy, and all in all I can not fault this bar in any way. I recommend leaving the bar for maybe a minute, after taking from the freezer – just enough the allow the initial chill to subside. This way the melt in your mouth chocolate and ice-cream ratio works perfectly. This said, should you leave it too long, the chocolate is thick enough to hold the ice-cream although the creaminess turns more to runniness; still good, but not the perfection we chocabloggers insist upon. solid piece of Galaxy chocolate that runs between the two fingers. This bit is kinda fun; you get to chomp on chocolate after the cool ‘n’ creamy meltyness. Good, but not necessarily essential. Filed under galaxy, ice cream, mars, uk. Mmmm, this looks yum. Are they sold in UK? Never seen them before – really must look better! Yes, they are in the UK. I think most large supermarkets sell them in boxes of 4. They may be available individually from smaller shops – I must look. It is really yummy. It is very favorite in UK.Greate taste. awh this ice cream bar is just like a little taste of heaven. Best eaten when left for a minute or two out of the freezer to melt a wee bit then the chocolate is soft nd the ice cream just plaays with your taste buds. Awh nicest ice cream ever. Pity i cant buy them in more shops in ireland. 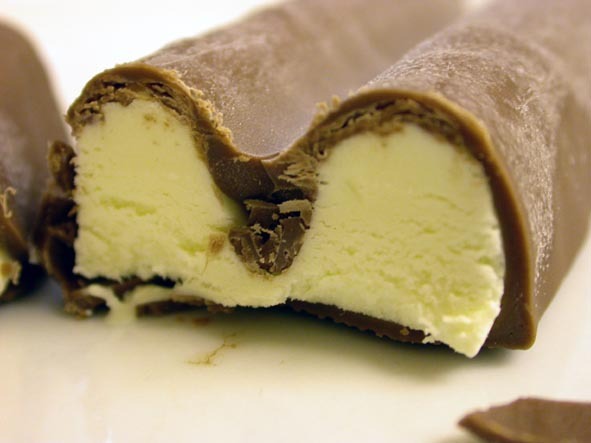 Why do none of the supermarkets no longer stock Gakaxy Vanilla Heaven ice cream bars? Any stockists out there? I use to buy boxes and boxes of these Galaxy ice cream bars – they are my all time fav. But sadly I’ve looked and not been able to find them anywhere for at least the past few years. Please start selling them in the UK again soon. PLEASE, PLEASE, PLEASE!! !